The Navajo Nation Council squashed a years-long battle over a controversial proposal for a tourist development at the confluence of the Little Colorado and Colorado rivers. Navajo Nation Council chambers sit empty just before the start of a special session on Oct. 3h1, 2017, to consider approving a bill for the Grand Canyon Escalade project. 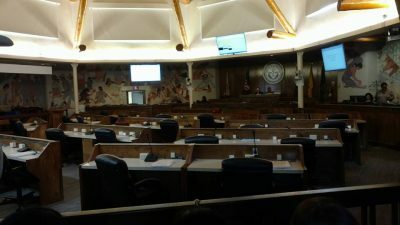 At a special session, the council skewered the Confluence Partners, who wanted to bring 10,000 tourists per day to an area containing sacred sites, grazing land, and traditional homelands to hundreds of Navajo families. 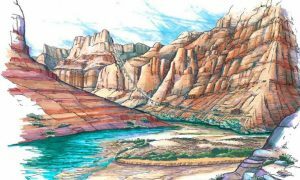 The developers wanted to build a resort that included a gondola tram that glided into the confluence of the Colorado and Little Colorado rivers, in Grand Canyon National Park. Ultimately, the council voted 16-2 to kill the measure. Don Yellowman, president of the Bodaway/Gap Chapter, said this is a step toward unity. For years, the proposed Escalade had divided the community. For more than a half century, families from this area were exiled under the federal Bennett Freeze Act. In spite of the law, hundreds of families — many traditional sheep and cattle herders — struggled for survival. The U.S. Census Bureau documented that their living conditions were unacceptable by any measure anywhere else in the world. More than 65,000 people worldwide had opposed the effort. The National Parks Service opposed it. All neighboring tribes opposed it. Navajo medicine men opposed it. Families that have lived on the land since at least the late 1700s, and have even buried their relatives on the proposed site, opposed it. In spite of that — in a last-ditch effort — Scottsdale, Ariz.-based Confluence Partners, LLC, on a Halloween “trick-or-trick” night — tried to sweeten the deal. After blistering criticism from many council delegates, in the face of knowing they would lose, the partnership’s representatives offered to build a Boys and Girls Club for the local residents. 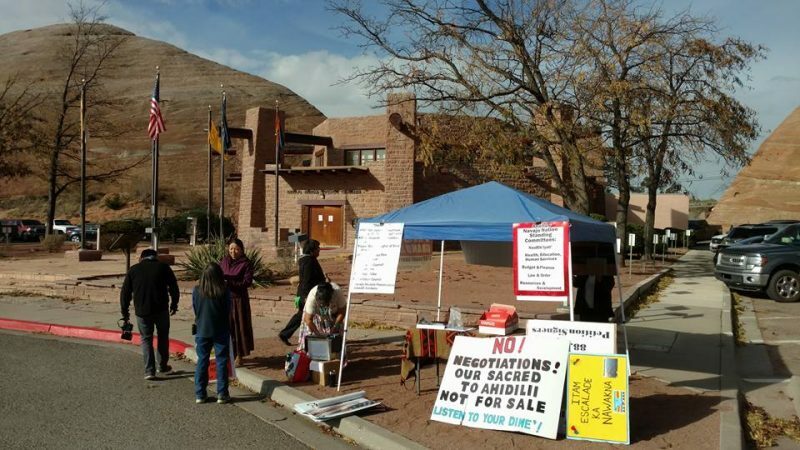 Their final offer underscored how out of touch they were with the community and the Navajo Nation, of which many chapters also joined hands to fight the effort. The community west of Highway 89 has lived for two generations without electricity, without running water, poor roads that bust tires often, inadequate public-safety services, substandard housing, and scant repatriation assistance since then-U.S. President Barack Obama lifted the Bennett Freeze, allowing people to finally come back home and rebuild. Residents of the area often say that the Navajo Nation, itself, has offered little-to-no repatriation assistance during the time that its elected representatives entertained the Escalade proposal. Then, the controversy over the Escalade project intervened, further preventing people from coming home. The prospective developers had been supported by Navajo Councilman Ben Bennett, the bill’s sponsor. Bennett said he wanted to give a five-member committee a chance to negotiate problems lawmakers found and raised about the bill. His colleagues made fiery statements in opposition, ranging from delegate Dwight Witherspoon’s comment that, “This (proposal) is exploitation! !”, to delegate Jonathan Perry who said, “We’re setting ourselves up for something bad.” Bennett has refused to respond to inquiries into why he has so ardently supported this proposal. Cell phone video by Navajo Nation Council Delegate Nate Brown during the vote against the Escalade project captures Confluence Partner R. Lamar Whitmer repeatedly flipping off the council with his middle finger. After the vote, in which only Bennett and delegate Leonard Tsosie voted in favor, developer R. Lamar Whitmer flipped off the council with a surreptitious middle-finger gesture. It was caught on video by delegate Nate Brown. Whitmer’s hand gesture was symbolic of the years of disrespect he showed to the Confluence families, often harassing, threatening and intimidating the families, rather than trying to help them understand his proposal. The on-and-off again bill struggled to reach the full council starting in August, 2016. None of the council’s four standing committees, charged with scrutinizing the bill, endorsed the legislation. Despite all of that, Bennett tried numerous times to re-introduce the measure. He often withdrew it on a moment’s notice if the political winds indicated supporters would not be present to vote. Then, in a last-ditch effort, Bennett called a special session on Halloween Day, when it appeared a majority of opponents of his bill would be out of town at a conference. Opposition remained overwhelming, regardless. Former Navajo Nation President Albert Hale, who left office years ago in the middle of his term amid financial and sexual scandals, and yet later became an elected member of the Arizona State Legislature, was among the Confluence Partners advancing the effort to undermine the Navajo People. A handful of demonstrators opposed to the Grand Canyon Escalade gather outside the Navajo Nation Council chambers in Window Rock, Ariz., on Oct. 31, 2017, as delegates begin deliberations on whether to approve the controversial tourist project. The Confluence Partners wanted the Navajo Nation to invest $65 million for off-site infrastructure, withdraw 420 acres for development, agree to ban tourist-related businesses within 25 miles, and waive portions of the tribe’s sovereignty. Artist’s rendering of Grand Canyon Escalade tram to the Confluence. 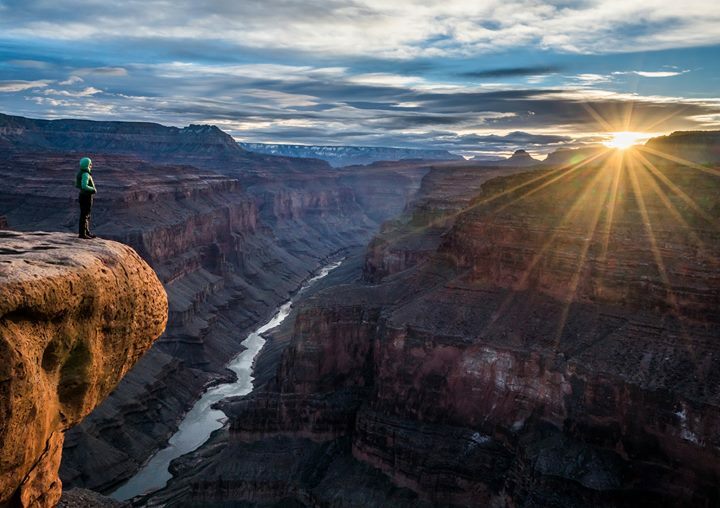 The partners proposed to install a gondola that takes tourists from the rim of the eastern side of the Grand Canyon down about 7,000 feet to floor of the canyon. There, a river walk, an amphitheater and café would be available. The rim would consist of A discovery center, a restaurant, cafeteria and parking lot. Under the agreement, the Nation would have received a mere 8 cents of the gross revenue per year while the outside non-Navajo partners – plus Hale — took 92 cents. The revenue would have been dependent on the number of tourists who visited Escalade.